Boasting 3,600 square feet of sail, the elegant schooner America 2.0 has refined touches, such as opulent teak decks and polished mahogany trim. The two-hour sailing adventure provides marvelous water views of some of Key West's most noteworthy attractions, including Fort Zachary Taylor, Mallory Square and the Sand Key Lighthouse, as they are illuminated by the rays of a setting sun. Guests enjoy complimentary champagne, wine, beer and soft drinks as well as hors d'oeuvres, such as shrimp cocktail or cheese and crackers. 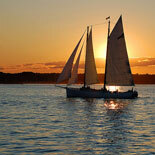 The journey also provides the opportunity to view dolphins, sea turtles and an array of aquatic birds. The largest and most elegant vessel in the Classic Harbor Line fleet, the America 2.0 is modeled after the iconic schooner that won the inaugural America's Cup yacht race. 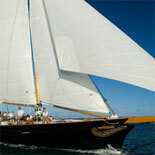 Built in 2011, the vessel features the classic nautical lines of a 19th century schooner coupled with modern amenities. In addition to a lightweight hull, the America 2.0 features composite fiber rigging and 3,600 square feet of sail that propel the schooner across the balmy tropical waters. This fusion of the past with the present creates a unique setting from which to experience one of Key West's renowned sunsets and marine animals frolicking in their serene habitat. The professional crew of this stylish ship will treat you like royalty as you sit back and relax on the comfortable seats. In addition to the complimentary drinks and hors d'oeuvres, guests are encouraged to bring a picnic basket to create a memorable al fresco dining experience. While you glide across the water, take in the vibrant palette of colors that emerge as the sea engulfs the sun and the stars appear in the heavens. 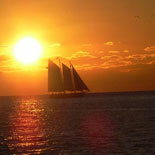 You can sail as part of a group or enjoy a romantic sunset with that special someone on this quintessential Key West voyage. Make a reservation today and obtain your eTickets for the elegant Champagne Sunset Sail Aboard America 2.0, a luminous jewel of the island's schooner fleet. Cruises daily from Nov-mid May. Times vary depending on season. Please check-in 15 minutes prior to sailing time. May 16-heads to New York for the summer. 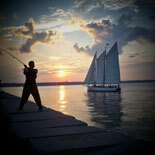 There will be some light food platters displayed on the Sunset Sail, but guests are encouraged to pack their own food box or pick up a picnic from the local Schooner Wharf Bar right next to the ticket booth. Illegal to bring alcohol of your own on board. ~ There are 3 private marine heads (bathrooms) and salons below- There is an area below deck where you may store your belongings ~ For our sunset sail we recommend wearing comfortable clothing and footwear (high heels are not recommended). Feel free to come in light, casual clothing, but bring a light jacket just in case, especially since you will be out on the water in the evening ~ Because we are guaranteeing your space on the sail, tickets cannot be refunded once purchased ~ Gratuity is not included in the price of the sail. 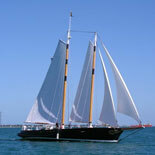 It is customary to reward your hosts with cash tips following the trip ~ the schooner is not wheelchair-accessible.